Home > Go Kart Parts > Go Kart Fuel Tanks, Pumps, Etc. > Nylon Plug 1/8'' N.P.T. 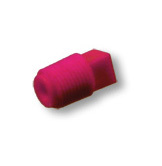 This a Nylon Plug with 1/8" N.P.T.